My adventure into self publishing a coloring book for adults is now a month old. I am as proud of The Classy Lady’s Coloring Book today as I was when I first conceived the notion in early January and completed the project in February, ready to publish. This 72 page book, available on Amazon, is filled with 30 original illustrations in black and white for grownups to colour. 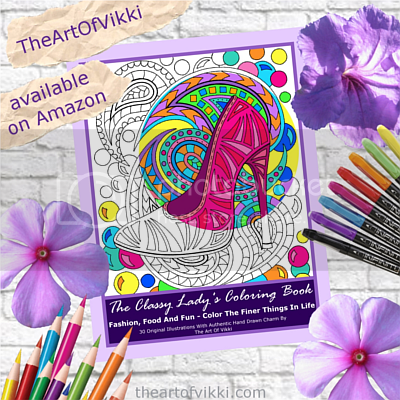 Featuring pictures that celebrate fashion, food and fun, The Classy Lady’s Coloring Book is printed with one art piece per page which avoids a bleed through to another design on the back. Each piece can be coloured separately and then framed and hung as your own piece of personalized artwork. My first coloring book for grownups is themed around the good life and celebrates fashion with ball gowns, shoes, a fabulous boot, handbags and yes, a tiara. There are also images of fancy food such as sushi, petit fours and caviar and beverages like champagne, a margarita, a classic martini and wine. The illustrations are rounded out with make up items like lipstick, nail polish and make up brushes and jewelry items like a pearl necklace, bracelets and yes, a tiara. Everybody loves a sparkly tiara! As I said in a discussion with a lovely lady about grownups who colour, why shouldn’t everyone have a chance to express themselves in some artistic form? 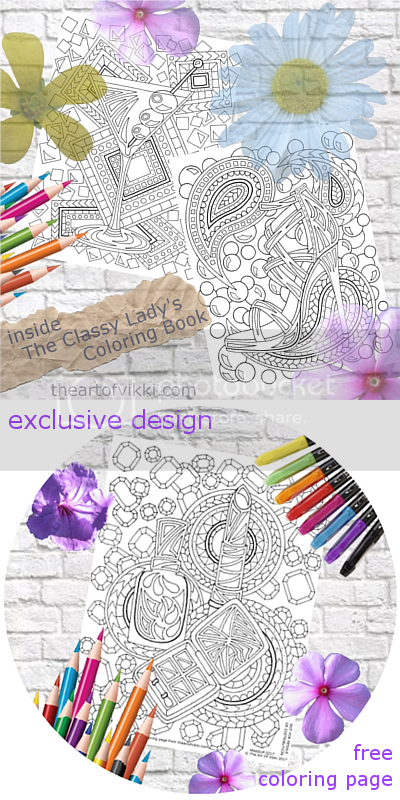 The Classy Lady’s Coloring Book is my offering to those who color as a form of art therapy and a way to relax. I draw for those who cannot; now it is up to you to make that drawing beautiful. So grab your pencils, your pens and your brightest markers and have at it. I would love to see how you personalize my images so post them to Instagram and be sure to tag @theartofvikki so I can see them! 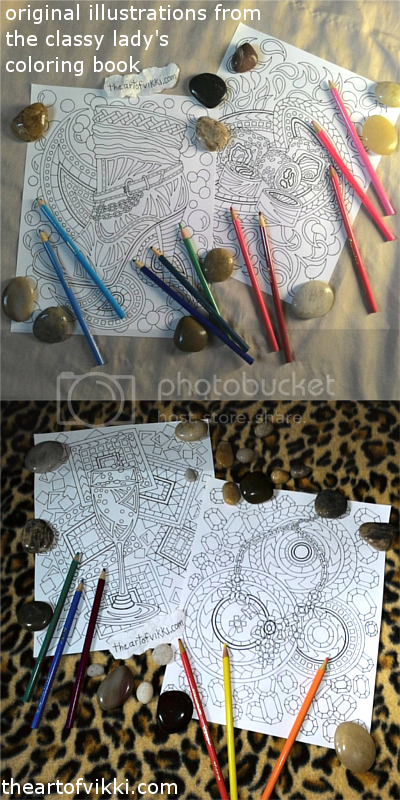 This entry was posted in Art and tagged art, art therapy, artist, coloring addict, coloring book for grownups, coloring book on amazon, coloring books for adults, coloring page, colouring book for adults, colouring books for grownups, colouring pages, creative, download free coloring artwork, fashion coloring book, free coloring page for adults, free colouring page for grownups, illustrations, stress relief, the classy lady's coloring book by The Art Of Vikki. Bookmark the permalink.